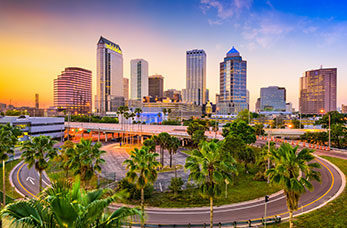 One of the major tourist attractions in Tampa, with a mix of thrilling white-knuckle rides. Busch Gardens contains a zoo with over 2,700 animals from all over the world. Florida Aquarium isn't your ordinary aquarium, this exciting marine life centre features behind the scenes tours, boat tours of the bay and even an opportunity to swim in a shark tank along with over 10,000 marine life plants and animals. Visit the Henry B. Plant Museum and explore the authentically restored rooms of this Tampa Bay Hotel as it transports you back in time of ten course meals and dancing the waltz. Enjoy a guided tour of the Ybor City Museum State Park an experience the rich cultural heritage of Ybor City. The park is located in the historic Ferlita Bakery building with a lush Mediterranean style garden and a recreated cigar worker's family home.